Generally speaking, the European settlers in North America coined the phrase 'Indian' or 'Red Indian' to describe the Native North American tribes they found while they were settling what is now the USA. To the north of this vast collection of varying regions and climates were the native settlements of what is now Canada, while to the south were the various peoples of modern Mexico, most especially the Aztecs. The Unalachtigo were located in the modern state of Delaware, on both sides of the Delaware River below Philadelphia, with their immediate neighbours being the Susquehannock to the west, the Munsee to the north, the Metoac to the east, and the Unami to the south. 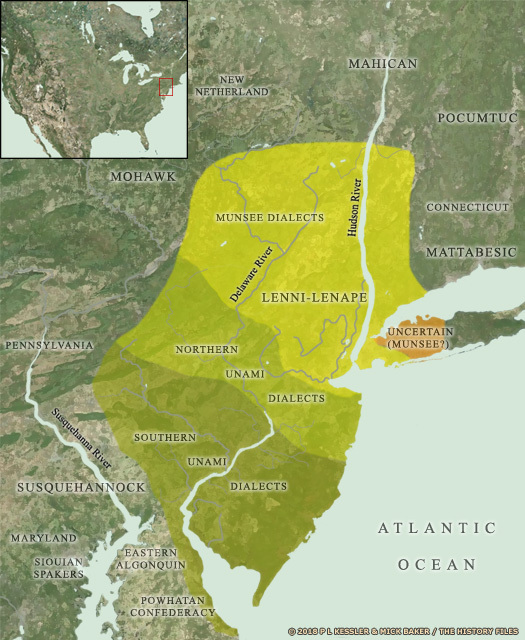 The Lenape called themselves 'Lenni-Lenape' (also recorded as Leni-Lenape), which literally means 'men of men', but is translated to mean 'original people'. From the early 1600s, the European settlers called the Lenape people 'Delaware Indians', although there was never a single tribe called either Delaware or Lenape. Overall though, they formed the most important collection of Algonquian-speaking groups in the region along the mid-Atlantic coastline, and once had occupied the Lower Hudson river valley, the western part of Long Island, the whole of the modern state of New Jersey, and as far south as Delaware Bay. They spoke two Algonquian dialects - Munsee and Unami. 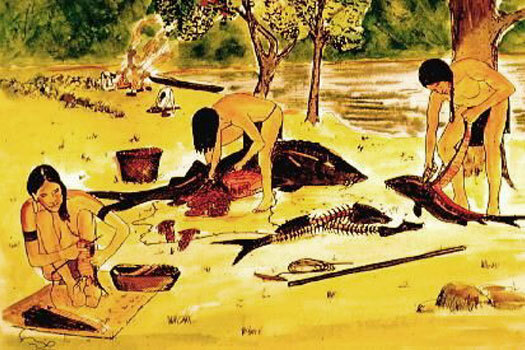 The Unalachtigo were the 'people near the ocean'. Amongst their many sub-tribes were the Nantuxet, Neshamini, Okahoki, and Sickoneysinck. Then there were the more tentatively-placed Amimenipaty, Asomoche, Chickohoki, Eriwonec, Hickory Indians, Hopokohacking, Kahansuk, Kechemeche, Mamankitonna, and Manta. The latter could have been a division of the Munsee but the Unalachtigo seem more likely. More tentatively-placed names include the Mingurinari, Naraticon, Quenomysing, Roymount, Sewapoo, Tirans, and Watcessit. The Sickoneysinck had a sub-division who were called the Chiconessex, but as always it's never quite that simple. The Chiconessex were also known as the Siconesse (the same name, but a noticeably different spelling), and could be divided into Big Siconesse and Little Siconesse. Although a large collective themselves, the Unalachtigo eventually became subsumed into the Unami. There is more than one list of Lenape chiefs available, and not all of them agree. In addition, none of them can be placed amongst the Unalachtigo with any degree of certainly, so the names remain on the main Delaware page instead. The Susquehannock, however, have an easier time against the numerous - but peaceful and disorganised - Delaware tribes who trade with the Dutch along the lower Delaware. The Delaware Lenape - and also the Dutch - are attacked by the Susquehannock from the Susquehanna Valley to the west. Long-time enemies of the Iroquois, the Susquehannock not only seek better access to the Dutch but are concerned that, if the Mohawk defeat the Mahican, they will also seize the Delaware Valley. There have long been wars between the Lenape and Susquehannock, but the sheer numbers of Lenape (three to one) has always been enough to keep the highly-organised Susquehannock at bay. By this time, the Susquehannock have forced many Lenape groups either south into what will become the state of Delaware or across the river into New Jersey. The Dutch of New Netherland accept the outcome, but when they begin to trade with the Susquehannock, they are pleased to discover that the Susquehannock (skilled hunters and trappers) have more (and better) furs than the Delaware. However, the compression of Lenape lands greatly affects the Unalachtigo. Seemingly the weakest of the three Lenape groups, they are gradually absorbed by the Unami. Following the Susquehannock driving the Lenape to the east of the Delaware River during the 1630s, the Unami absorption of the Unalachtigo is now largely complete. By the time the Susquehannock allow the Lenape to reoccupy the west side of the river during the 1660s, there are really only two divisions: Unami and Munsee. Even the ranks of these large groups are currently being thinned by sweeping epidemic, weakening the Native American cause considerably when it comes to withstanding colonial advances into fresh territory.